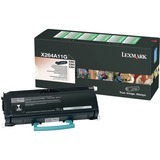 Make a Professional Impression with the Lexmark X264A11G Black Toner Cartridge! Never compromise. Because Lexmark?s Standard outpaces the competitors, you can keep up-front costs low and quality high. Get outstanding results page after page, year after year with the Lexmark X264A11G Black Toner Cartridge. Superior Lexmark design means precision pairing between printer and cartridge for value, quality and environmental responsibility you can count on.